A ZIMBABWEAN court has spared a minor from serving jail time after he suspended passing on sentence on him after he was convicted for committing public violence during an anti-government protest held in January over the country's worsening economic crisis. The 16 year-old juvenile was arrested in January and charged with public violence as defined in section 36 of the Criminal Law (Codification and Reform) Act. 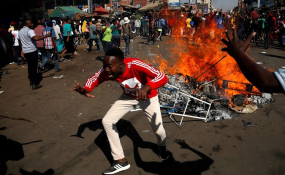 Prosecutors alleged that the minor, who resides in Mbare, one of Harare's oldest high-density suburbs, committed public violence when he allegedly participated in a demonstration in which some disgruntled people protested against the arbitrary hiking of fuel prices and the worsening living and economic conditions in Zimbabwe. Mbare Magistrate Kudzai Zihove, who early this month convicted the juvenile, on Monday 11 March 2019 suspended passing on sentence against the Mbare resident on condition that the juvenile represented by lawyers from Zimbabwe Lawyers for Human Rights ZLHR, will not be convicted of public violence charges for the next five years. At Harare, Magistrates Court, Magistrate Victoria Mashamba on Monday 11 March 2019 set free six Harare residents, who were arrested in January and accused of burning a bus belonging to the state-run Zimbabwe United Passenger Company during an anti-government protest. The residents, who were charged with committing public violence in contravention of section 36 of the Criminal Law (Codification and Reform) Act, were set free after their lawyer Paidamoyo Saurombe of ZLHR challenged their continued placement on remand without being put on trial and yet the State witness had not been attending court proceedings. Magistrate Mashamba advised the State to summon the residents to stand trial if at any time it intends to prosecute them.